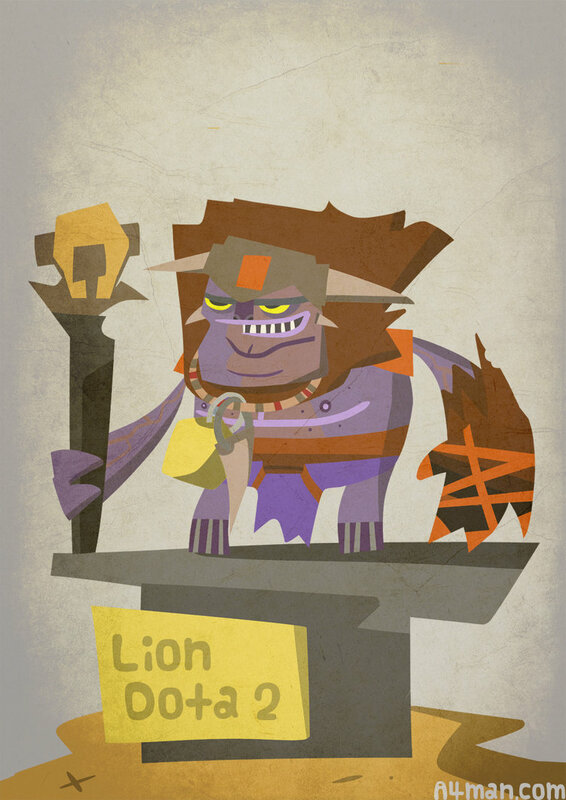 Once a Grandmaster of the Demon Witch tradition of sorcery, Lion earned fame among his brethren for fighting on the side of light and righteousness. But adulation corrupts. With powers surpassed only by his ambition, the mage was seduced by a demon and turned to evil, trading his soul for prestige. After committing horrible crimes that marred his soul, he was abandoned. 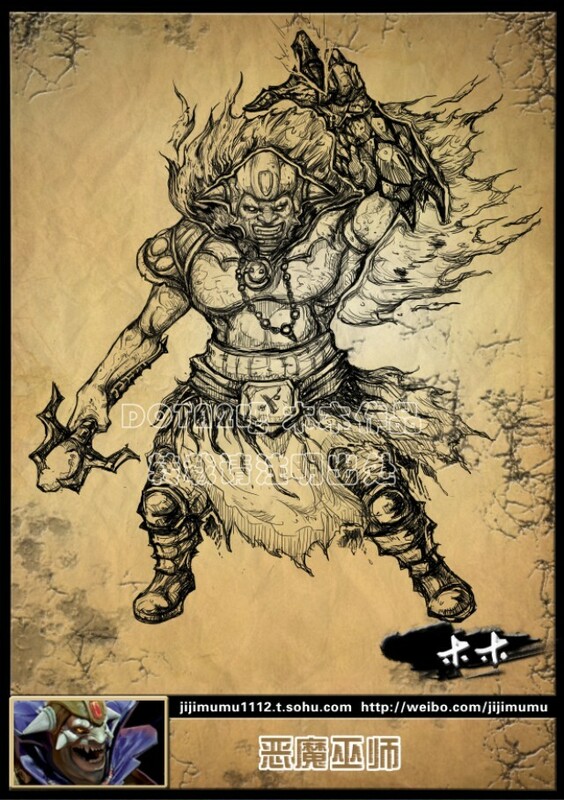 The demon betrayed him, striking better deals with his enemies. Such was Lion's rage that he followed the demon back to hell and slew it, ripping it limb from limb, taking its demonic hand for his own. However, such demonoplasty comes at a cost. Lion was transfigured by the process, his body transformed into something unrecognizable. He rose from hell, rage incarnate, slaying even those who had once called him master, and laying waste to the lands where he had once been so adored. He survives now as the sole practitioner of the Demon Witch tradition, and those who present themselves as acolytes or students are soon relieved of their mana and carried off by the faintest gust of wind. 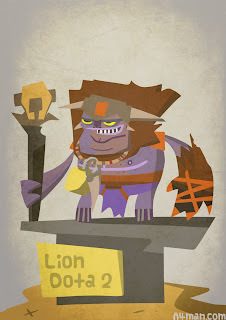 Lion is one of the best ganker in DotA. He have 2 kind of disables, a stun and a hex. He also have a deadly ultimate that can one-shot a low HP enemy hero until death. You are considered a squishy hero, so don't trade blows with enemy' carries. Cause you will be death soon. Lion is also considered an initiator for teamfights and ganks. Blink Dagger will help you to initiate a teamfight or gank. You must Blink into near the opponent and then stun / hex him. And after he is being disabled, and you + friends must use all of your skills to kill him. that's it for the introduction of Lion. This is your skill to stuns the enemy in a straight line in front of you. Careful! Because of the nature of the skill, it can miss sometimes. You must place this skill carefully. You must only cast this if your you are already beside your target. That's because if you already clicked this skill from far away, the miss rate will be high. A Blink dagger may helps you into a better initiation. You need this skill for ganking. This is must skill to chase enemies and stun them. And a stunned enemy is your friends breakfast. Makes your opponent becomes Frog and can't do anything. This skill is very powerful in an initiation. You come and make enemy becomes Frog, and that's your team's chance to kill him quickly. The accuracy of this skill is better than the Earth Spike because it is a targeted spell and cannot miss. So if you only facing a single opponent, it is recommended for you to use Hex first before the Earth Spike to make sure your enemy is being disabled. This ability will drains mana of one enemy. Can be casted on ranged lane creep or some neutrals. This skill is an almost "bad" skill to take. Without this and with just +stats you still be able to cast your other skills. And with +stats is more powerful because also adds +damage and +mana & mana regen from +int, and +HP from +str. Rips at an enemy unit, trying to turn it inside-out. Deals massive damage. Upgradable with Aghanim's Scepter. This is your ultimate, you can one-hit kill enemy with this skill. This skill has a decent single targeted damage that can lasthit enemy hero in one shot. If your carry cannot kill the target, that's your chance to get 1 kill, with this skill, is easy to kill 1 hero in low HP, especially in early-mid game. Very good to kill steal peoples, but not recommended to kill steal a carry in a competitive games. That will make your team's carry become poor and your team will be so weak. Why you should maxed the Earth Spike first? This is the nuke you need for early-mid game. You need this for farming, harassing, and ganking. This can also provide you with a defense mechanism, while being ganked, immediately stun the enemies and makes yourself / team safe. Why you should not taking the Mana Drain? Well it's not a bad skill at all but it will surely can't fit the fast phase in a teamfight, it takes long time to drains one's mana. Increasing the additional Stats is a better choice because it gives more HP, more mana pool, and more damage. Usually, Lion takes a support role in a match. Support role is role that responsible to buy animal courier and some wards. You are capable of doing that because you do not need so much farm. You are a skill dependent hero that not need many luxury items to be good. Lion can also become a solo-mid, a solo-mid er don't need to buy the wards and the courier because a solo-mid needs to be the farther in terms of farming, to be the best in maps in terms of level and items. Last hitting and harrassing is your main priority on the mid lane. Last hitting and harassing is rather easy for this hero. That's because you have a decent range of 600. That is considered far than other hero so that you can dominate enemy hero on farming phase. You can use Earth Spike once in a while for harassing and also last hitting the creeps. Please keep an eye on the warded place. So you can retreat when you see the enemy is coming to kill you. If you have a carry partner in lane, you can helps him with denying the creeps. Please do not last hits or your carry will become poor. If he become poor, he cannot carry your team to win the late game. If there are enemies trying to get firstblood by killing you or your friend, you can use Earth Spike immediately to stun them, and run for your safety. Or you can get firstblood with Earthspike. Ask your partner to do it together. Focus on a target and your team will ge tthe kill. Please replace the Observer Ward that is already expired with the new one. The team will always needs a vision of the fog of war. That will be needed to make sure your friend not being ganked so you can saves lives. Please ask your partner to keep their eye on the warded place for their own safety. Mid game is the time for ganking activities. Once you already got your ultimate, you can choose a target to be ganked. Please confirm your friend about who your target is. Then together you can focus fire on him. Check your target ability first. So if he can become invisible, make sure you bring the item needed to reveal them. You can buy a gem, sentry wards, or dusts. If your target is only a single target, we recommend you to use the Hex first before the Earth Spike, it will 100% disable the target. Remember that the Earthspike can miss if the target moves. And then all your friends should come too and use their ability to the target. And if hasn't die, kill with Finger of Death. Don't use Finger of Death if he is 100% death without using it. A Blink Dagger will really helps you in ganking. Blink in to the enemy and immediately stun/hex him and kill him using right click and Finger of Death. Late game is the time for decisive teamfights. Remember to keep calm here. A little mistake can cost you the game. As a support, better to always replace the expired wards. That is needed to keep an eye of every enemy's move. In late game teamfight, your part is to disables enemy using your 2 skills, Earth Spike and Hex. You need to act quickly by using Dagger or Force Staff if you have one, and stun / hex one target and makes him get killed before the teamfight start. You are considered an initiator-support for the team, it is ok for you to give your life if that will makes your team to win the teamfight. Why Bottle? An early item that can fulfill your needs as a mid laner is a Bottle. It helps you to get some runes for ganking. it also refill your mana and HP for your daily needs. And bottle will makes your time regenerating HP and mana in fountain becomes less. Why Arcane Boots? This boots provides mana for you & your team. Can replenish 135 mana for the team. Why Refresher? This item makes you can use your skills 2 times, 2x Stun, 2x Hex, and 2x Finger. Very powerful item to win a teamfight. 100 increasing the chance of winning a teamfight. But before you buy this item, check your mana capacity first, if your mana is enough to use 2 times stun, 2 times hex, and 2 times finger, then you can buy this item. Have a sweet ultimate combo with you. Laguna Blade + Finger of Death will gives opponent the true nightmare of instant kill. with about 2000 instant damage, this heroes combo is a true nightmare to all who dare to oppose them. You have a single targetted ultimate which is required to know which one is your real target, and cloners can makes you to waste your ultimate if you choose the wrong target. You also have hex that is a single targetted skill. But, you have Earth Spike to know the real self of enemy, by using Earth Spke on Cloner hero with his clones, the hero which have more HP left is the real hero, then you can focus on the real one.